Setting speed limit warning 1. Setting speed limit warning 2. You can use the SET button to set, alter or cancel speed limit warning 1. – Drive at the desired maximum speed. – Press the SET button in the instrument cluster ⇒ fig. 22 for one second. – Drive the vehicle at a minimum of 5 km/h. – Press the SET button for at least 2 seconds. 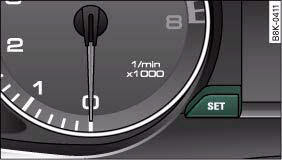 The speed warning symbol lights up briefly in the display to confirm that the selected speed has been stored. The speed limit that has been set remains stored until another speed is set with a brief push of the button, or until the memory is cleared with a long push of the button. When the speed limit has been cleared, the display will show a crossed-out warning symbol . You can use the sound system or MMI* to set, alter or cancel speed limit warning 2. – Select: Function selector button CAR > Instrument cluster > Speed warning. • Speed warning on/off - to activate or deactivate the speed warning function ⇒ fig. 23. • Speed warning - to set the speed above which a warning signal will sound. Speed limit warning 2 can be adjusted in increments of 10 km/h between 30 and 240 km/h.